Today i decided to call myself EX-patient 2.0. I feel great. I had two good results on test rounds and just don’t feel like a patient anymore. Also I am now back to working loooots of hours. Check out the video below of our latest SPRX project called Layar. An Augmented Reality browser. At the time of this post it had over 256.000 views on Youtube. So that’s what I am busy with. Apart from making sure Lori is happy. Also, as I am now EX-patient 2.0, my blog updates will be less frequent. Actually, as they were already! Thanks for all the love. CT Scan Results Were Good! Good news again. Makes you happy doesnt it? Me too! I use the following metaphore for a CT scan result meeting. Its like having to cross a busy a road without being able to see the traffic. And you only know it went well when you are on the other side. Well I am on the other side again, safe and sound. Now its back to work. Next CT scan is in 3 months. Next week on June 4th it will be my one year cancer diagnosis anniversary. To mark the occasion I am taking Lori and two other friends to see the Dalai Lama who is in town. Less then a year after my cancer diagnosis I climb the Sommet de Lure. 1748 meters high. Hi All. Its been awhile. Been busy with work and life in general. Its good! Tomorrow, May 27th at 8:30 in the morning I’ll get my latest test results. We’ll see what it brings. Its also almost a year ago, June 4th 2008, that i was diagnosed. To celebrate that I climbed the Sommet de Lure. Its a big *** mountain in southern France. Here is the climbing profile. Just like Mt Vetoux yet a bit smaller. It was a hell of a ride. I did make it and that’s what counts. I did it for @lorilens and @sprx. And thanks to Rutger and Bert for having and getting us there. Due to the wind you can hardly hear me. Thats ok, after 20 km of cycling up the mountain it wasn’t that coherent. BTW i thought the climb would be 7.5 km… in the end i stopped every 1000 meters to catch my breath. Less then a year after my cancer diagnosis I climb the Sommet de Lure. 1748 meters high. Woooooot for lori and sprx! Come celebrate with me on April 18th. I’m turning 38 and kicking Theo’s b*tt! What a year it has been! Lets celebrate, the party starts at 16:00 and is at our house on Archimedeslaan 41 hs in Amsterdam. Partners, pets and kids are welcome. Lets see how full we can get it! All twitterazi, friends and family are invited! Fill in the form so you and I know who is coming and is bringing what. 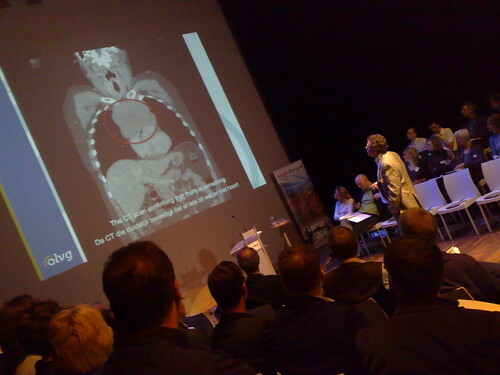 The day before I got the good news I was at the Healthcare 2.0 Event in Nijmegen to share the story of Maartensjourney for the first time. I was asked to do this by Lucien Engelen who organized the event. The way how I share my cancer exploits via my blog is apparently unique in the world. Not all patients have a blog and share everything online. It was weird plowing through all my old tweets, posts and video’s. @michielb made a special version of the Waves of Love for the presentation. A stand alone version from the day i got cancer to the last chemo day. I remember thinking of the concept to show other people how twitter helps me. For those who don’t know what it is: It shows my twitter messages on the left and the reactions on te right. The best version has the oldest message on top and works itself down with time. Going through all the first part of the Waves of Love really took me back in time. Heavy. Although I love being on stage this story was a bit different. It was not a concept of pitch I was doing. It was my own story. Key message was that being transparent supported me, helped others and improved my treatment. Through my transparency people with the same form of cancer found me and helped my to uptodate and specific treatment information. Together with my oncologist I was able to filter this and act on it. Together with my oncologist i co-directed my treatment. Today I got the results from the first checkup. And they were GOOD. We were very nervous because it would confirm or not our decision last December not to go back to chemo and wait to see of it shrinks. We we made the right decision. Thanks to Matt, Dr Einhorn and my own doctor. The tissue that’s left has shrunk a little and seems to be scar tissue (that’s what it does, it’s just there and shrinks a little. Tumor tissue doesn’t). The lesions on my lungs have shrunk or even disappeared. Lori and I are very happy! Please come and celebrate the good news with us on April 18th.